Hanjin Shipping Co. announced recently that its mobile web service has been upgraded further to accommodate smart phone applications and it has been operating the mobile web service since Jan. 2 this year. The shipping company said its mobile web service has been reorganized to expand and add such services as cargo tracking, vessel tracking, “my cargo” tracking, visibility summary and point-to-point schedules so that it can accommodate more information in real time using smart phones. In particular, the company made the mobile web service more convenient for the customers by installing icon services at the beginning of the menu, not in texts, and cargo owners are able to track down where their cargoes are during shipping even if they don’t know the numbers of their container cargo or shipping bill numbers and can confirm the estimated arrival time because the company issues cargo notification on its mobile web service. The upgraded mobile web service is expected to have customers confirm all kinds of shipping services provided by Hanjin Shipping through its cargo notification from booking confirmation to empty container return. Manager Lee Ki-bong of the Shipping Service Support Team, said Hanjin was the first shipping firm that provided the mobile service in 2004 and, therefore, is fully aware of the importance of the e-Service’s value to its operations and the recent upgrade reflected the company’s understanding of the importance of such a service. He said the company will continue to upgrade the e-Service further in the future so that customers will have access to information about its cargo service and operations through the mobile web service regardless of time or location. Hanjin launched its internet homepage back in 1997 for the first time in the shipping industry and began providing the e-Service for its customers via the web. The company continues to offer upgraded mobile web services to its customers by coping with the changes in the IT business environment under its management principle to continue to provide segregated and reformative services. In the meantime, Hanjin Shipping President Kim Young-min was nominated to be on the Lloyd’s List Top 100, being named as the 43rd shipping company CEO as announced by Lloyd’s List, a daily on global shipping, on Jan. 14. The shipping daily, with 276 years of history, created the 2010 Lloyd’s List top 100 to consist of persons working in the shipping industry with outstanding marketing experience, performance results and leadership as screened by editorial members of the daily. Lloyd’s List, in selecting President Kim, noted his growing importance in the world shipping industry, which is dominated by the American and European shipping companies and global shipping councils, in getting Asian shipping firms onto the world shipping councils by creating environments conducive for their participation with his influence as head of the TSA. Hanjin Shipping officials said Kim took over as head of the TSA early last year amid sluggish shipping trends impacted by the global financial crisis and played a key role in the recovery of world shipping, especially in the Pacific shipping routes, facilitating the exchange among cargo owners in North America and the Asian region for their further development. The CEO made the JOC Readership Roll 12 published by JOC, a leading journal on shipping, along with such well-known businessmen as Warren Buffet, chairman of Berkshire Hathaway, and Michael Duke, chairman of Wal-Mart, making him the first Asian on the list. The Lloyd’s List top 100 included Minister Li Shenglin of the Ministry of Transportation in China, Nils Anderson, CEO of AP Moller-Maersk, and John Fredrikson, chairman of Norway Frontline. A number of other Koreans on the list included Chairman Min Keh-sik of Hyundai Heavy Industries in 22nd place and Chairman Kang Duk-soo of STX Group. (left) Hanjin Shipping Chairperson & CEO Choi Eun-young. 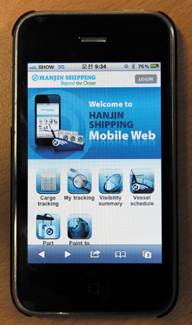 Hanjin Shipping has upgraded its mobile web service.